The short answer is - probably! If you see a yellow button ' New! Commission artwork' on an artist's storefront, that means they are open to commissions. When you're ready, the artist will send you a Commission Proposal. All you need to do is check the details and accept it, when you're ready. If you want it to be changed at all, just let the artist know and he/she will be able to edit it. We will then facilitate taking the deposit (via invoice) and monitor all progress throughout the proceeding. We will collect the final balance (via invoice) upon completion, put the order through on your behalf and send you a confirmation email to that effect. 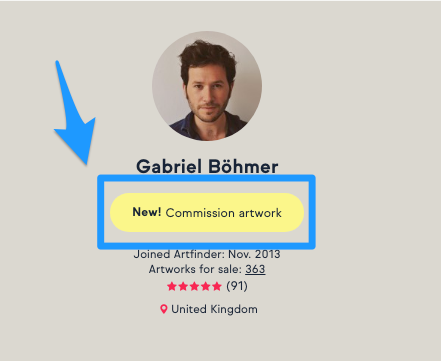 You can keep track of all messages in the Commission request section of your account. For more information, see our specific Commissions page and, as ever, if you have any questions, please contact our dedicated support team on customers@artfinder.com, or reach our commissions team directly on commissions@artfinder.com.